Carter Page, a U.S. citizen who was a foreign policy adviser to the Trump presidential campaign in early 2016, was surveilled under Title I of the Foreign Intelligence Surveillance Act. The FBI used the so-called Steele dossier—written by former MI6 agent Christopher Steele and paid for by the Clinton campaign and the Democratic National Committee—to portray Page as “an agent of a foreign power,” specifically Russia, to the Foreign Intelligence Surveillance Court (FISC). FISA warrants on U.S. citizens must receive formal approval from the FISC, which requires that there be probable cause to believe the proposed target is a foreign power or an agent of a foreign power. A FISA warrant allows for some of the most invasive methods of spying on an American citizen. Baker said that the FBI’s process of obtaining a Title I FISA warrant would typically originate from an FBI agent at a field office. That request would then be reviewed within the field office, by various supervisors within an escalating chain of command. As Baker stated in his testimony, there would also be a “legal scrub” at this point. From there, the request would entail interactions and approval from the Office of the General Counsel and FBI headquarters. Once approval had been granted by the FBI, the request would be moved from the bureau to the Department of Justice’s Office of Intelligence, where the FISA request would undergo “a complete review at various levels” within the department. Baker testified that once everyone agreed that they wanted the request to go forward, there would be “a signature process that the agencies go through” that included the director of the FBI or the deputy director. From there, the assistant attorney general for national security, the deputy attorney general, or the attorney general would sign the FISA prior to its presentation to the court. According to Baker, once the application was presented to the FISC, legal advisers assigned to the court would review the applications in order to “scrub them.” Only then would a FISA application be presented to an actual federal district court judge who concurrently sat on the FISC. At that point, the FISA judge would review the application and either grant or deny it. Notably, a primary component of the Page application was the Steele dossier—without which, according to FBI Deputy Director Andrew McCabe, no FISA warrant on Page would have been sought. Yet, despite the rigid description provided by Baker and Anderson, it appears the linearity process was not adhered to in the case of the Page FISA. 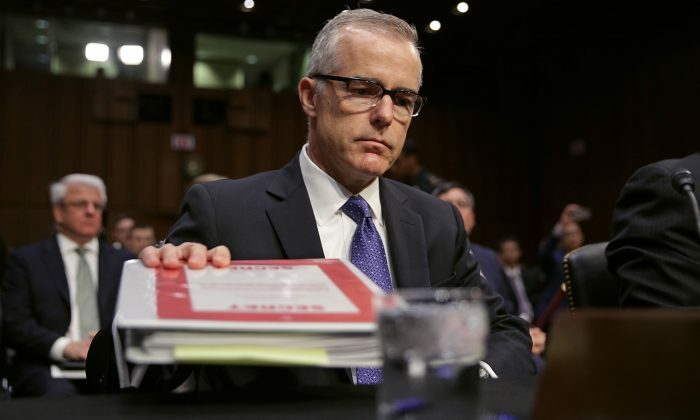 According to Anderson, pre-approvals for the Page FISA were provided by both McCabe and Deputy Attorney General Sally Yates, before the FISA application was ever presented to her for review. The unusual preliminary review and approval from both McCabe and Yates appear to have had a substantial impact on the normal review process, leading other individuals like Anderson to believe that the Page FISA was more vetted than, perhaps, it really was. It is not known why McCabe and Yates both chose to insert themselves at an early stage into the Page FISA process. McCabe, who was fired for lying to the DOJ inspector general, is currently being investigated by a grand jury. Yates, who was fired by President Donald Trump for failing to impose the so-called “travel ban,” was responsible for the issuance of a July 2015 opinion that allowed the DOJ and the FBI to refuse the inspector general access to information collected under Title III of the Federal Wiretap Act. Anderson also testified that she had not read the Page FISA prior to signing off on the application and passing it along to Comey for the final signature. The signing process by the FBI director appears to be more of an official act than any sort of actual review. Anderson testified that each day, the director might receive 15 to 20 FISAs to sign, with each containing large amounts of documentation. “[They’re] very thick. It’s not unusual for the Director to receive a stack this tall. I’m indicating about a foot and a half between my hands here, for the benefit of the reporter,” she said. Anderson testified that the director was allotted 20 minutes in which to review the entirety of the day’s FISA applications—not 20 minutes per FISA. Even during normal circumstances, Anderson noted that she did not view it as her primary responsibility to provide any verification or fact-checking of the FISA applications. According to Anderson, FISAs would typically return from DOJ inspection with a cover note that “summarized the FISA,” and unless an issue had been identified by the cover note, she typically wouldn’t read the actual application “because of the time pressures involved and the sort of very-last-stop-in-the-process nature of the review.” Anderson also testified that the only way she would be aware of the legal predicate for probable cause would be through the DOJ cover note. Anderson told investigators that her direct supervisor, Baker, had personally read and reviewed the Page FISA, lending her additional confidence in the review process. However, according to Baker, he had only read the “factual section” relating to probable cause and had not read or reviewed any other section, including the Woods file. The Woods file, which provides facts supporting the allegations made in a FISA application, is attached to every application and is provided by the originating FBI agent in each case. Baker, during questioning as to why the FBI failed to disclose the political motivations of dossier author Steele to the FISC, testified that this fact should have been vetted during lower levels of preparation. Moyer told investigators that “the person that’s signing the application is relying on the individuals who have signed the Woods form that they have the Woods file.” Moyer stipulated that in some cases, the supervisory special agent at FBI headquarters who is signing off on an application might choose to review the Woods file, but that it was not done for the Page FISA. Baker told investigators that he felt it would be very difficult for the FBI or the DOJ to intentionally try to trick the FISC into issuing a FISA without sufficient evidence. The Page application was largely reliant on the Steele dossier, a series of memos that was unverified at its time of submission to the FISC and remains unverified to this day. Circular reporting, provided by Steele himself, was used as corroboration of the dossier. Additionally, Trump campaign adviser George Papadopoulos, whose conversation with Australian diplomat Alexander Downer was used to open the FBI’s July 31, 2016, counterintelligence investigation, is referenced in the FISA, yet there “is no evidence of any cooperation or conspiracy between Page and Papadopoulos,” according to a House Intelligence Committee memo. Meanwhile, Moyer testified that without the Steele dossier, the Page FISA would have had a “50/50” chance of achieving the probable cause standard before the FISA court. Notably, to this day, the Steele dossier is considered to have been largely discredited. Nor is the judge the only official that holds determination in this matter. According to the practices sent by Walton, the government also can request a hearing. “In conjunction with its submission of a final application, the government has an opportunity to request a hearing, even if the judge did not otherwise intend to require one,” Walton wrote. It’s worth reminding ourselves that the Page FISA was not just another run-of-the-mill surveillance warrant placed before the court by the intelligence community. Page had been a foreign policy adviser to the Trump campaign in the midst of a presidential election. A FISA warrant, as noted by Baker himself, is an intrusive surveillance technique that is only to be employed under very strict circumstances and subject to rigid oversight and processes. But as can be seen from the example of the Page FISA, the intent behind the process appears to have been subsumed by the process itself, relegating the various levels of oversight to what appears to have been a series of rubber stamps. The FISC itself appears to have performed little better. A damning 99-page unsealed ruling from the FISC, dated April 26, 2017, and issued by presiding Judge Rosemary Collyer, provided further insight into additional FISA abuse engaged in by the Intelligence Community in relation to Section 702 data and minimization procedures. Section 702 permits the government to surveil foreign persons located outside the United States for the purpose of acquiring foreign intelligence information. Minimization procedures are intended to protect any U.S. person’s information that is incidentally acquired in the course of Section 702 collection. The FISA court found that the government had been engaging in a long pattern of significant abuses that were revealed to the court by then-National Security Agency Director Adm. Mike Rogers. “On October 24, 2016, the government orally apprised the Court of significant non-compliance with the NSA’s minimization procedures involving queries of data acquired under Section 702 using U.S. person identifiers. The full scope of non-compliant querying practices had not been previously disclosed to the Court,” the FISC ruling read. The FISA process has been the target of ongoing abuse from various elements within the intelligence community, and the processes and procedures that we have been told protect us appear to be routinely compromised at will. As a result of the April 2017 FISC ruling, changes to the FISA process have been made. Nevertheless, a complete re-examination of the entire FISA system appears to be not only warranted, but perhaps necessary.